Forget the London Dungeon: some of London’s goriest and most interesting museums exhibit real dead things: St. Bart’s Museum of Pathology and the Hunterian Museum of Surgery. And they’re both free-entry. If, like me, you’re a creep who loves seeing dead things, London is the right place for you. Sherlock fans will have already heard of the St. Barts Museum of Pathology in Clerkenwell, set of many scenes featuring the uber-successful series starring Benedict Cumberbatch. 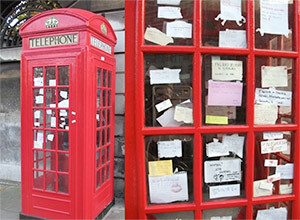 Messages on the walls and phone booths will show you some over-excited fans were there. At St. Barts you can see over 5,000 human remains preserved in formaldehyde, including a left hand preserved intact to show advanced Gout (c.a. 1933), the bound foot of a Chinese woman (1862) and a portion of a liver, showing the deformity produced by prolonged wearing of corsets (1907). If you haven’t had enough of dead things, the Hunterian Museum of Surgery in Lincoln’s Inn Fields contains approximately 3,500 specimens and preparations from surgeon and anatomist John Hunter‘s (1728-1793) original collection. Recently reviewed by BuzzFeed, the Hunterian Museum is a great place for a weekend stroll. On display here you can find everything from specimens showing the effects of various illnesses on the body to animal skulls, from the human nervous system to the skull of the Irish Giant, 2.31m tall. Dimenticatevi il London Dungeon: se vi piace vedere resti umani, Londra ha pane per i vostri denti. Due fra i suoi più inquietanti musei sono ad ingresso gratuito! Il St.Bartholomew’s Hospital di Clerkenwell, noto ai fan di Sherlock per una delle scene più drammatiche della seconda stagione della serie TV BBC, dà accesso ad oltre 5000 resti umani conservati in formaldeide. Continuate a leggere se avete il coraggio, ma un avvertimento: le foto non sono per i più deboli di cuore. Tra i resti umani in esposizione al St.Barts’ Hospital ci sono una mano gonfiata dalla gotta, un piede legato di una donna cinese e un fegato danneggiato dai corsetti donato all’ospedale nel 1907. Aperto dalle 13.00 alle 17.00, il St. Barts’ Pathology Museum si può raggiungere seguendo le intricate indicazioni della piazza principale dell’ospedale. Se non ne avete ancora abbastanza di vedere gente morta, l’Hunterian Museum of Surgery a Lincoln’s Inn Fields contiene circa 3,500 esemplari conservati in formaldeide, tutti provenienti dalla collezione originale del chirurgo e anatomista John Hunter (1728-1793). All’Hunterian Museum potete vedere di tutto: da vari resti che mostrano l’effetto delle malattie sul corpo umano a teschi animali, dal sistema nervoso allo scheletro del Gigante Irlandese, alto 2.31m. A Londra non si scappa dalla morte.